E Stop button. Is there any designs out there? Just a newbie here and looking to do a few changes to my machine. Mostly to a peace my OCD! Has anyone designed an E stop for this machine? I see the board has a pin location for it but not sure if it is functional. 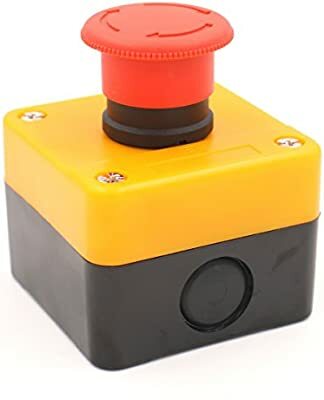 I am in the process of making an enclosure for my XXL and was looking for ideas on a “PANIC” button I can quickly press when the inevitable screw up happens. I used to try and make things like this, but not worth it and I didn’t do as good a job as buying them now. Amazon has many buttons for this job. I use two of theirs. Package included: 1 x Weatherproof Emergency STOP Push button and some screws. Tip：If you need the Momentary Emergency Stop Weatherproof Push Button Switch,Please search the Asin:B078SWQD8K . I was wondering if the E-stop pin site on the Carbide 3D board was usable. A powerstrip is probably the simplest solution but was curious if a simple switch connected to the E stop pins on the board would be a more elegant solution. My understanding is the E-stop pin is more of a feed-hold — see the documentation on the Stepoko on GitHub. Although it stops motion, the E-Stop pin is, by default, connected to the reset. It will reset the controller and position will be lost. Unless you have your router wired into your controller, your router will not stop. Most cases probably only require a feed hold, but when things are going REALLY bad (fire, Z-axis falls off, etc) I’d want all power to be cut. I ran power to my table, with separate switched outlets for the controller and the spindle. I used two regular 15A switches positioned conveniently for quick shutdown. I’ve used them a few times now, and they work fine. Looks like the most simple answer is the external switch approach. I was wondering what others have done. Right now just adding some exciting features to include the Jtech 7w laser engraver and a HDZ Axis upgrade. I have had to pull the plug on Grandma a few times now, due to my LOFT… (lack of … talent) definitively see the need for a conveniently located E Stop. On a related subject: Has anyone installed additional limit switches to the Sapeoko? Is there a location in the control board to connect them? I’ll share an outline of what I did for my “pan-pan” button (i.e. almost-an-emergency stop) that I have in addition to my “mayday” button (a.k.a. the nuclear option). Positive from the power supply runs up through the NC (normally closed) side of the e-stop button, then through the small switch (which I mounted alongside of the e-stop button), and down to the IoT Relay. Negative connects straight to the IoT Relay. The router then plugs in to a normally off receptacle on the IoT Relay. I used the connector from my Shapeoko Touch Probe’s pigtail (not needed with the newer controller boards) to connect to the well-labeled FEED_HOLD pin pair on the top right of the controller. The wire pair goes up to the NO (normally open) pins on the e-stop button. In normal use, the e-stop button is unlocked and ready to be slammed. The router power is controlled by the small switch next to the e-stop button. If things start going wrong, I hit the e-stop button, which breaks the circuit to the IoT Relay, killing the router’s power, and triggers the FEED_HOLD circuit on the controller. I can then clear the issue I was about to encounter, then unlock the e-stop button and continue. My pan-pan button, which basically pauses the machine and lets me deal with something before everything goes completely pear-shaped, is not a substitute for a mayday button. If you’re grinding into a clamp and throwing white-hot sparks all over your dusty workspace, you don’t want a “pause and contemplate” button like I described above. You want an “Oh, [expletive]!” option that kills everything dead now. That can be a big switch, power cable, second “really e-stop” button with an IoT Relay, or whatever. If you catch something about to happen, having a pan-pan button to pause everything and then resume is great. Once you’ve crashed and skipped steps or whatever, you’ve got to start back from homing, so killing all power is logical. Oh, and at least a few times, I’ve painted myself into a corner and, while I hit my kinder, gentler button to pause before something bad happened, there was no recovery that wouldn’t involve crashing, so with the machine stopped, I calmly and quietly leaned over and turned off the Shapeoko power. On a related subject: Has anyone installed additional limit switches to the Shapeoko? Is there a location in the control board to connect them? I’ve actually mused a couple times on actual limit switches (as opposed to homing switches) which would stop the machine from attempting to travel outside the box. I figure I could just wire them in parallel with FEED_HOLD, so if a job is attempting to run off the rails, it’d automatically enter a feed hold (at which point I’d shut it down and contemplate the error of my ways). I’d have to sacrifice a small amount of travel at the extreme ends in order to add switching, but it would make it a lot more forgiving if I, say, forgot to reset zero before the job.